My husband and I have a small cabin near Big Bear, which is about an hour and 45 minutes away from our house. Since the drive is a long span of uninterrupted time, we often start to chat together and end up having meaningful conversations about various things we’re thinking about. On our way to the cabin last Saturday, we started talking about our walks with God and about Christ’s return, which has been the subject of several recent sermons at our church. In Nick’s sermon a few weeks ago (he’s one of the Pastors-in-training at our church), he mentioned how we should be longing to be with Christ, just as we long for our spouse’s or family’s return when they’ve been away. Well, Kyle and I are no strangers to longing for each other’s return. We don’t just long for each other when we’re away on trips, but every day while Kyle’s at work, we’re both counting the hours till he gets home and we can be together again. Even after having been married for 11 years, I still long for him when we’re apart because I just love to be with him. We don’t have to be doing anything in particular – I just love him, and I love to just be in his presence. But, that got me thinking… If I also love the Lord, and supposedly love the Lord more than I love Kyle, why don’t I often long to be in His presence in the same way? I WANT to feel close to God and to just bask in His presence, but I only actually experience fleeting moments of that. As Kyle and I were discussing it together, it occurred to me that part of the reason for my feeling that way is because God isn’t with me physically – I can’t sit by Him or feel Him near me, so I often have trouble feeling close to Him. I know in my head that He’s always with me, but that knowledge doesn’t often make the leap into my heart. And, this week, especially, I’d been very distracted by various things in my day-to-day life and had been feeling isolated and far from God. But, then, today I opened my mail…. My brother-in-law and sister-in-law’s, Pastor’s, wife’s, sister (wrap your head around that!) has a prayer ministry through her church. Every month, she faithfully sends me a letter of encouragement and writes how she’s been praying for me. This morning, I opened her letter and was amazed at its contents. 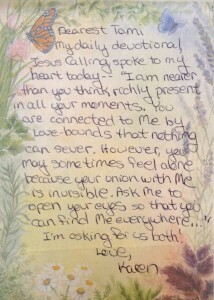 She was inspired to write to me about a devotional she’s doing from Sarah Young’s book, “Jesus Calling”. 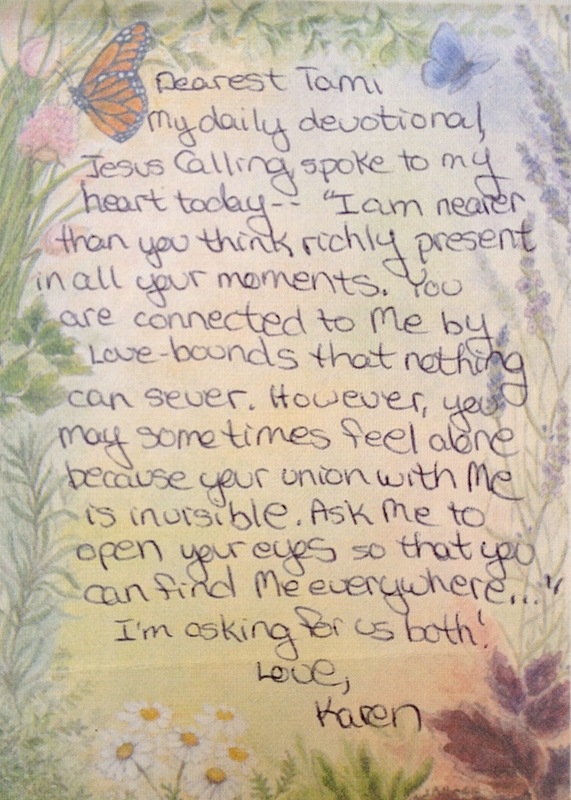 Here is an excerpt from her note, “My daily devotional, ‘Jesus Calling’, spoke to my heart today – ‘I am nearer than you think, richly present in all your moments. You are connected to Me by love-bonds that nothing can sever. However, you may sometimes feel alone because your union with me is invisible. Ask me to open your eyes so that you can find Me everywhere…” I read that and was stunned. God had not only heard me, but had answered and encouraged me and in such an unexpected way! In my small, finite mind and heart, I so often forget the nearness of my Savior, but He is always so faithful to bring me close to Him again. And, I was absolutely overwhelmed by what a loving and SPECIFIC way He had chosen to do so this time! He brought tears to my eyes and humbled my heart! He reminded me that every moment, He is there, even when I can’t see Him – even when I feel alone. He is not influenced by my fleeting emotions, but is constant in His unending love and grace for me. What a Savior we have in Jesus! He, who created us, and knows our hearts, who chose us from before the foundation of the earth. And, what a loving Father we have who meets us in our every day moments, who faithfully reminds us how much He cherishes and delights in us, and who draws us into His arms so we can bask in His presence, even though our union with Him is invisible. We would love to hear from you! Please let us know how the Lord has reached out to you this week and shown you evidences of His nearness in your life! When I read things like this, I find myself feeling sad because of the separation it seems that many people have with Christ. Devotionals and prayers that personify Christ and turn Christ into a separate being only serve to distance us from the truth that Jesus said would set us free. The reason we are slaves to Christ is because we are all manifestations of Christ, of God, of the Holy spirit. These things are not separate, but are one and our failure to realize this causes us much pain. I see this with my daughter when she talks about Jesus as a separate being apart from her and I have to tell her that she needs to realize that Christ is manifest within her and that we are all the same. The second coming of Christ is this realization and is not about a guy in a robe coming back. It is the story of the prodigal son, the return to the father and being loved more than ever. Our salvation comes from realizing that we are not who we think we are, and therefore are infinite as manifestations of Christ. Christ is now, Christ is here and has always been here, we just had eyes but could not see, and ears but could not hear. When we see this, find this truth, this will set us free from our ego’s, our minds, and we will see Christ in others and one day put down our weapons, put away our beliefs and realize we are all brothers and sisters. Thanks so much for taking the time to both read and reflect on Tami’s post today. You had some interesting thoughts, some of which were confusing to me so I have a few questions, if that’s okay! I’m not sure what you mean by Christ being manifest in us. Are you talking about the Holy Spirit that lives in us as believers and allows us to live in a Christ-like way and reflect Christ to the world? You said you don’t like it when devotionals personify Christ as a separate being – what do you mean by that? Separate from who? I do believe that Jesus is living in me through the Holy Spirit – teaching me, correcting me, revealing His Truth to me so that I may be set free from my sinful nature and free from the lies of the world. But I also believe that Jesus is a separate being who sits at the right hand of God in heaven but who will return to earth one day and I will see Him face-to-face as my Savior. Part of that separation, I believe, has a purpose in making us long for the time when we will be face-to-face with Christ and when we will be with our Savior for all eternity, never to be separated again. That, I believe was one of Tami’s points in this post. I’d love to know more of your thoughts!